Walking along Quay Street in Galway, I stopped at number 17, a brightly painted blue and yellow pub that had a Jameson whiskey barrel next to the door. The sign above the door said the pub was “Tigh Neachtain” and it looked to be an interesting place. I stood there for a minute or so, and the longer I looked at that doorway, the stronger the urge became to take a peek inside. I crossed the threshold. Inside I found a warren of little rooms and old-world snugs. Here and there someone was having lunch or coffee. In front of a wall of bottles a score of beer tap-handles poked up from the bar, waiting for the day’s customers. Off to the side a peat fire smoldered in the fireplace, perfuming the air with its unmistakable aroma. I felt that time had come to a complete standstill all about me. 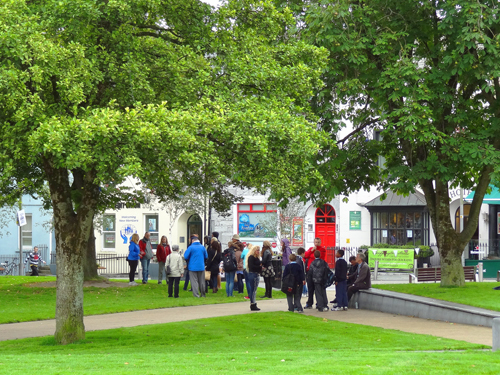 Amazingly, I found many places where time stood still in Galway, the center for most of the Irish-speaking regions of western Ireland, where people strive to preserve the old culture. 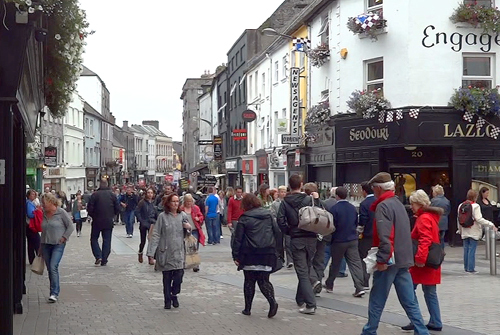 You only need to be in Galway a few hours to feel the old Irish traditions that thrive here, and only a bit longer to realize that Quay Street and the surrounding Latin Quarter are the center of it all. The multi-colored buildings of this pedestrian-only area, its numerous restaurants and old-world pubs, the charming shops and, most of all, the people themselves, drag you into a cultural time warp. But it’s at night when the place really comes alive as locals fill the pubs to enjoy a bit of “craic,” or traditional Irish fun. 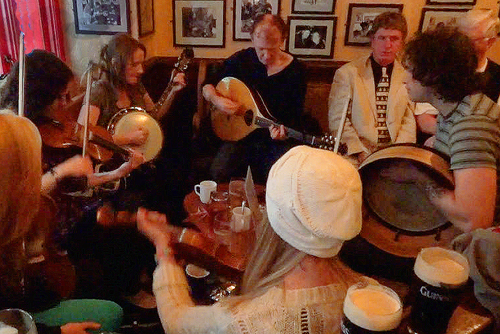 That’s when you can experience authentic traditional Irish music, all kept alive thanks to Ireland’s unique pub culture. There’s nothing quite like sipping a drink in the evening, while elbow-to-elbow with a crowd of locals as the melody of fiddles and song fills the pub. At any time of day, whether it be in a pub or a restaurant, you find no lack of places to eat along Quay or throughout the Latin Quarter. Walk along the street and you’ll be attracted by the painted people on the second- and third-floor windows of Riordan’s, which proudly advertises on its awning that it serves home-cooked Irish food. Across the street is McDonagh’s seafood house, which at first you could almost mistake for a McDonalds sans the golden arches, doing a brisk take-out business. 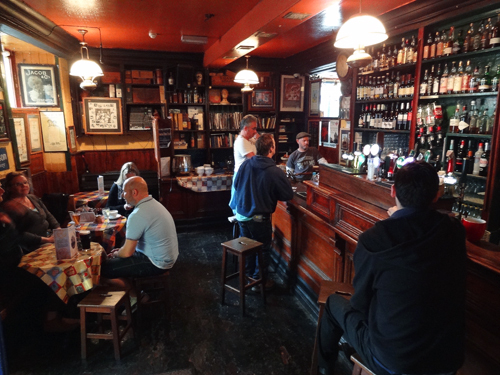 A few pubs down you’ll find several bars and dining areas on different levels in The Quays restaurant where among other items you can order traditional Irish Stew, an oak-smoked salmon salad or a half-dozen fresh oysters, each for €11.50. I had lunch in The Quays and later wandered down the street to Spanish Arch, where five centuries ago Spanish traders used to unload their ships. Across the river on the west bank is the old Claddagh, an area where for centuries a close-knit Gaelic community lived. The only remnants of that community today are Claddagh rings, the still-popular Gaelic betrothal rings that traditionally were handed down from mother to daughter. I didn’t go across to the west bank but instead headed back up the street, stopping when I saw the bright red doors of Auntie Nellie’s Sweet Shop. Through its window I could see shelves were filled with seemingly hundreds of jars containing all sorts of sweets and candy, much of which I suspect was made the same way as it was a hundred years earlier. When I went inside I found that it was crowded with women – I was the only male in the place – most of whom I guessed were buying gifts to take back home. I continued my stroll back up Quay, past where it turned into High Street, to the Church of Ireland’s St. Nicholas Church, which was a lot more interesting and beautiful than the Catholic cathedral I had visited the day before on the other side of the River Corrib. It remains a beautiful medieval church, even though Cromwell once used it as a horse stable when he attacked the town in 1652 due to its allegiance to the British monarchy. What I liked most about St. Nicholas were the plaques on the walls around the church, some dating from the 1700s. They included one dedicated to Jane Eyre, who made a donation to the church for bread to be given to 24 poor people on every Sunday during their lives, forever. 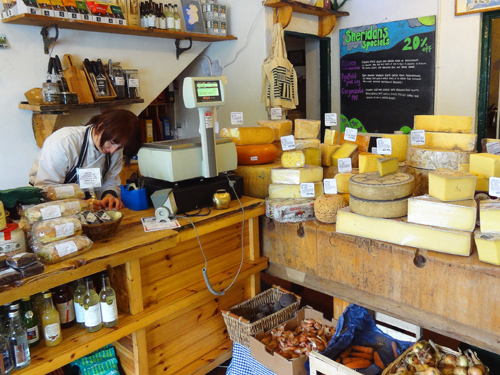 After leaving the church I came across Sheridan’s Cheesemongers on Churchyard Street, an interesting cheese store (to be totally honest, I find most cheese shops interesting) offering a good variety of Irish, British and European cheeses. I looked about for a while but resisted temptation and continued on further up the street where I passed Griffin’s Bakery, which appeared popular both for its baked goods and it’s take-out sandwiches and sweets. 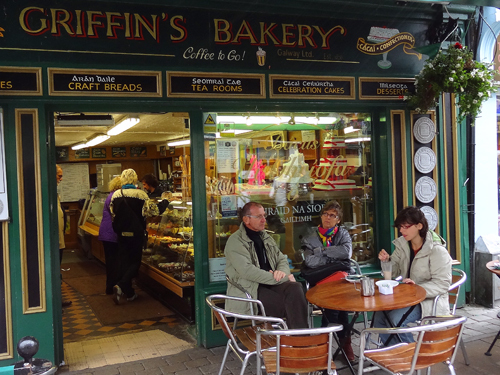 Griffin’s is at the lower end of Shop Street, a street known for, what else, but its multitude of shops along its length. 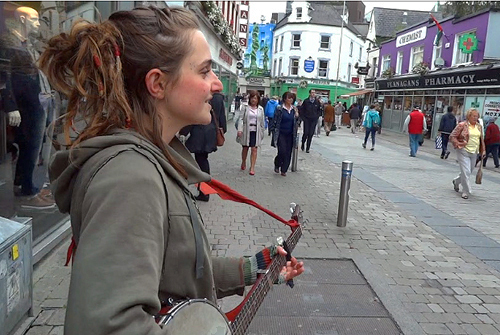 It’s the heart of the city for both the locals and the tourists and during the day is an impromptu stage for a variety of street musicians. Walking down it one morning from where Kennedy Park anchors its upper end, I came across a quartet who had gathered a small crowd about them. They were singing traditional Irish songs, keeping up a steady banter with the crowd between songs and selling their CDs for €10 each. 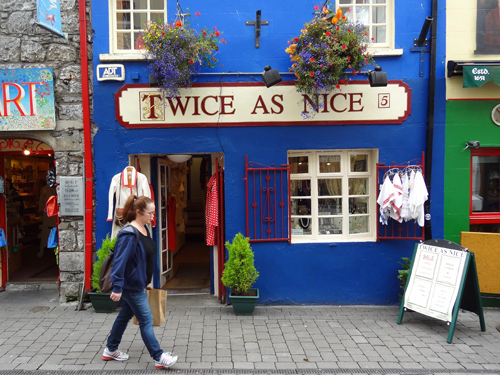 “Be sure and buy one of our CDs,” one would say, “it’s a special today: buy one get one.” “You can’t buy it in the stores,” called out another, ‘they won’t have anything to do with it.” It was pure Galway, just as I’ve experienced it over the years. Walking further along I noticed that different musicians weren’t playing only to tourists, as is so often the case elsewhere, but also to many Irish, as well. Interestingly, several times I saw an older Irish man or woman who were walking along the street come over and drop a few coins into a guitar case or hat, and just continue on their way. 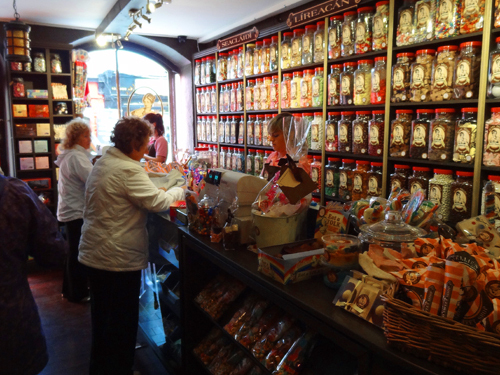 A euro here, a euro there…all little contributions to keep the old culture alive. My visit to Ireland was partially sponsored by Tourism Ireland. As always, however, all of the views and opinions expressed are strictly my own – J.F. Yes, it is a great town isn’t it? One of the most fun places in Ireland!